The tiles used in a bathroom are very different from materials used in the rest of the house, and great care should be taken when buying them. Bathroom tiles are the most detailed aspect of your bathroom design, and they come in a variety of shapes, sizes, patterns, and textures. Color – Beige and lighter colored tiles are more suitable for smaller bathrooms. On the other hand, deep colored floor tiles can be used in larger bathrooms to create a more dramatic effect. Floor Design – The design you choose will depend a lot on the overall concept of your home. 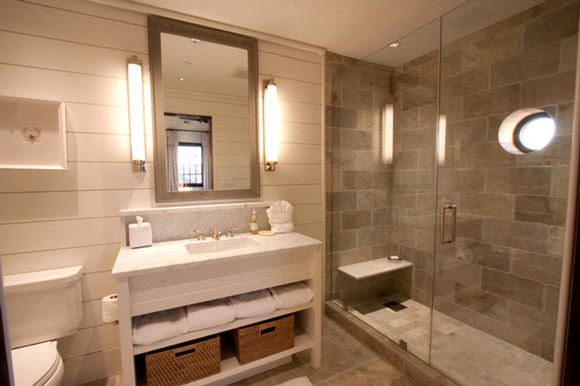 Make sure that the design you use in your bathroom will blend well with the rest of the house. Maintenance – The tiles you use should be easy to clean and stain resistant. Having bathroom tiles that are difficult to clean can make your bathroom look dingy and old. Be sure you consider practicality. Budget – This is a major factor when deciding which tiles to use. Ceramic or marble tiles are normally more expensive from both material and installation perspectives. However, they tend to last longer than other types of bathroom tiles, such as laminate.